Your wedding day is arguably the biggest day of your life, so it goes without saying that the makeup you wear not only looks perfect, but also portrays you in a good light on those all-important wedding photos. When choosing makeup for your wedding photos, it is important that your skin is fine with the products being used – you do not want any last minute blotches or rashes! The foundation and colours that you use should also blend perfectly with your skin and be suitable for the light that you are to be photographed under. For outdoor wedding shots, try to hold off until the sun is setting, as this is the most complementary kind of light. In terms of makeup, satin-matte foundation, some lightly applied pressed powder, and powder brush will enhance your complexion. If spots are a problem, apply some medium coverage concealer. Eye makeup should be soft matte colours, with brown (not too dark) liner. Be generous with the mascara – three coats is not too much. Lipstick can be the colour of your choice, but make sure that it’s long lasting. Avoid using lip-gloss before shots, as your lips will come across on photos as being too shiny. Indoor wedding photos will require a different approach to makeup and a yellow foundation – free of titanium or zinc oxide – will be essential. Apply concealer after foundation to mask any imperfections and discolourations. Never apply the concealer before the foundation because the skin can appear blotchy. Also, try to avoid products that give skin an extra shine or you may look like a ghost on camera! 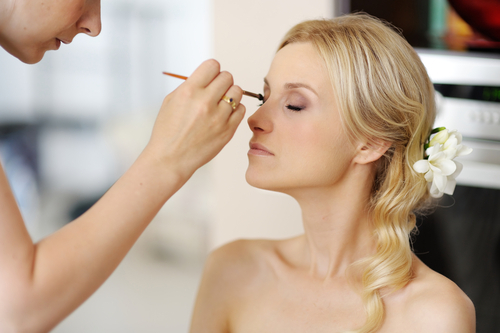 Like other aspects of wedding planning, begin experimenting with makeup ideas as early as possible. Have a number of trial sessions and pre-wedding shoots until you find the look you desire for the big day.